PLANS for a statue of Pembroke’s very own king Henry VII on the Mill Pond Bridge took a step further last Saturday (Oct 3) when a large audience gathered to hear Welsh author Terry Breverton deliver a well informed talk on the Tudors and Pembroke. Also present was Tudor historical fiction author and Pembrokeshire native Tony Riches and Tudor historian Nathan Amin. A brief introduction was given by town Mayor Pauline Waters who stressed the importance the support of the town council for the project. A presentation was then given by Linda Asman Chairman of the local History Society who has been largely responsible for the development of the campaign to date. Following Terry Breverton’s insightful address all present were invited to look at an initial mock up of the proposed statue and to make their views known to those wanting to make it a vital part of any future tourist attraction in the town.. Adding his support Nathan Amin author, of “Tudor Wales” said, “I feel very positive about this initiative, I have campaigned for a statue in the past. West Wales is a hotbed of Tudor history with its castles and houses and we do need to promote it as a region. It will be a wonderful tourist attraction for the area. It is certain that should a statue be sited on this bridge, the backdrop of the castle would ensure this monument’s location would be one of the most spectacular in the country. It would give an overt and obvious indication of the importance of the castle to the Tudor story and could prove to be a lucrative marketing aspect for Tudor addicts. It is all very well having exhibitions inside, but the key is attracting people to the area in the first place, and a statue would certainly do that. 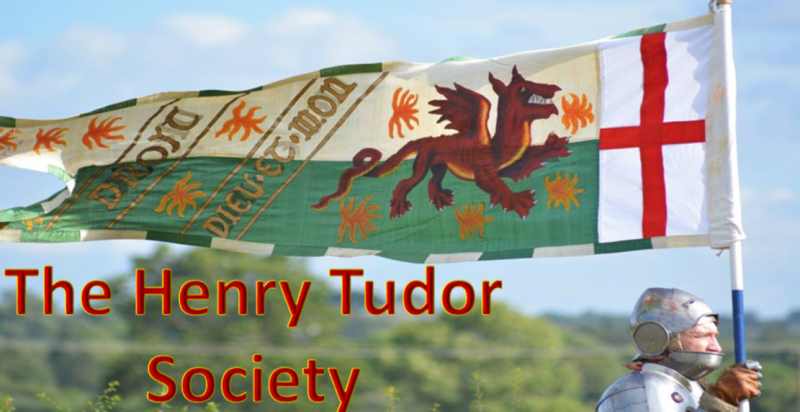 If anyone wants any more information on the Tudors they could Google the Henry Tudor Society or visit our Face book page”. Heavyweight Tudor monarch King Henry VIII was about to marry for a seventh time but called it off after getting cold feet, a former University of Leicester academic has suggested. Historian David Baldwin, who has written books about Richard III, has said that Katherine Willoughby, Duchess of Suffolk, was close to being the seventh Mrs Henry VIII. The revelation has come to light in Baldwin’s new book, Henry VIII’s Last Love: The Extraordinary Life of Katherine Willoughby, Lady-in-Waiting to the Tudors. In it, he says Willoughby was a friend of Catherine Parr – Henry’s sixth wife – and became the focus of the king’s affections. She was appointed a lady-in-waiting to Henry’s last three queens, and in February 1546, six months after her husband’s death. David said that it was rumoured that Henry intended to wed her himself if he could end his present marriage to Catherine Parr. The Leicester historian based much of his research on dozens of letters Katherine sent to William Cecil, Lord Burghley, who she relied on for advice. Katherine, a staunch protestant, fled to Poland when Queen Mary I (Bloody Mary) came to the throne, returning to England after Elizabeth I succeeded in 1558. She married for a second time and died in 1580. Nathen Amin, of the Henry Tudor Society, said he was not convinced that Henry would have been attracted to Katherine Willoughby. He said: “I feel that the thought of remarriage crossed Henry’s mind and Katherine Willoughby was certainly one of the most interesting women at court. Without a doubt she would have caught the king’s attention at various points in her life. “Ultimately it seems she would have been too similar to his sixth and last wife Katherine Parr, to whom the Duchess was a confidant in matters of religion. From Katherine of Aragon to Anne Boleyn, and from Anne to Jane Seymour, Henry seemed to be attracted to wives dissimilar to their predecessor. World-renowned historical author Philippa Gregory will be the guest of honour at Bosworth next week for the launch of the Battlefield Heritage Centre’s new galleries. Gregory, whose works include Plantaganet and Tudor titles The White Queen and the Other Boleyn Girl, will be officially opening the first significant changes to the exhibition displays at Bosworth since the discovery of Richard III’s remains by archaeologists from the University of Leicester. The story of the search for the lost battle location, finally realised in 2009, has been refreshed to become The Bosworth Battlefield Quest. Visitors to the exhibition will be able to follow the hunt for the site of the battlefield by exploring clues – including the Ricardian ‘boar badge’ and a unique collection of 34 cannon shot – with a few red herrings thrown in along the way. They can also have a go at ‘re-fighting’ the battle and see who wins this time round. In the final gallery the reigns of Richard III and Henry Tudor are explored as well as the contrast in their deaths and burial. The galleries also features objects from Leicestershire’s collections which include tiles ripped from priory floors, medieval and Tudor coinage and certain religious artefacts. The displays, which will be officially unveiled on Tuesday, have been developed with input from the Richard III Society, the Henry Tudor Society and the University of Leicester.